Happy New Year! 2015! Gosh, it sounds like something of the future. Did everyone have a good new year's eve? I sure hope so. 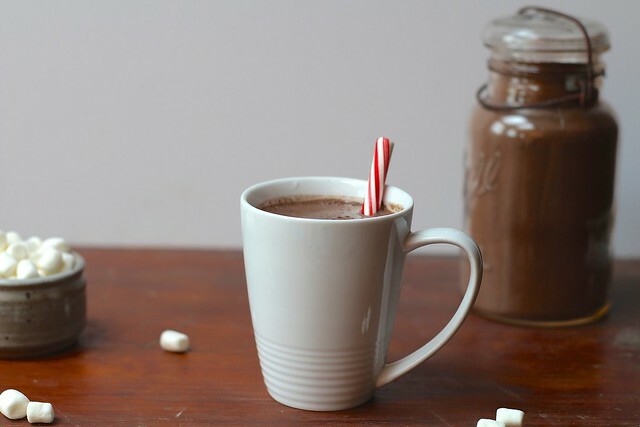 Now that Mother Nature has decided that it's going to be more like winter, I wanted to share with you this fabulous diy hot cocoa mix. Lately, it has been my best friend. Yesterday's temp was -8 when I got up. The coldest it has been yet! With howling winds and blowing snow, all I want to do is curl up inside next to the fire with a cup of hot cocoa. And of course snuggle with the baby. Speaking of said baby, she has her first tooth working through! Also, she is basically sitting up on her own, AND she is trying oh so hard to crawl. To the point that she is getting so frustrated that she can't get her legs moving. She rocks back and forth thinking about it, but the brain connection isn't there yet. She is already 6 months old! My baby is growing up way too quickly. On to this hot cocoa mix. It blows the pants off store bought mixes. I honestly don't think I could go back to Swiss Miss anymore. This stuff is the real deal. It's rich, velvety and all around delicious. In the past, I have decorated little jars and gifted it to friends and family. It makes a great hostess gift for the cold months! 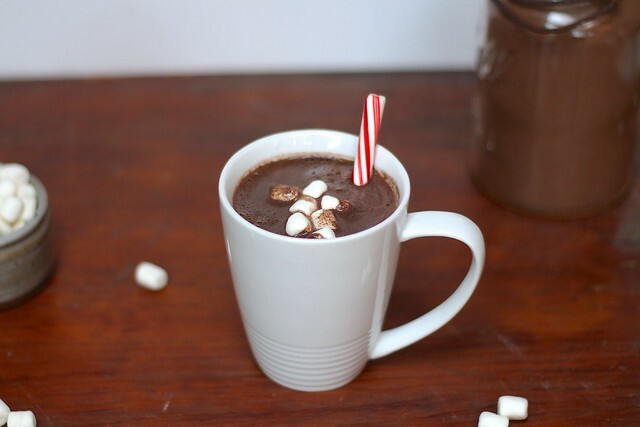 I mean really, who doesn't love hot chocolate? This is well worth the effort and ingredient list to make this yourself. It keeps for months. So it will last you the winter without going bad. Well, that is if you can resist drinking every day. Split and scrape the vanilla beans into a large bowl or jar with the sugar. Work the vanilla seeds into the sugar with your fingers until evenly distributed. Bury the pods under the sugar, cover tightly and let stand overnight (or up to months) at room temperature. (You can do a large batch of this vanilla sugar and keep the pods in the sugar to add extra flavor. It's fantastic to use in homemade ice cream or any vanilla flavored desserts.) Remove the pods when ready to use. In the bowl of a food processor fitted with the metal blade, combine the sugar, semisweet and bittersweet chocolate, and Dutch process cocoa powder. Process in 4-second pulses until the chocolate is very finely ground and the mixture is well combined. Store the mix in an airtight container for up to 6 months. To serve: combine 2 tablespoons cocoa mix with 8 oz. of hot milk and stir to combine until well blended. *You can easily cut this recipe in half if you don't have a large food processor. This is what I do and works just fine!